Maybe this is a sign that I'm thinking too much about baked goods right now, but Alison Goodman's The Dark Days Deceit reminded me very much of one of those professionally decorated sugar cookies—technically impressive, but not that much fun to consume. 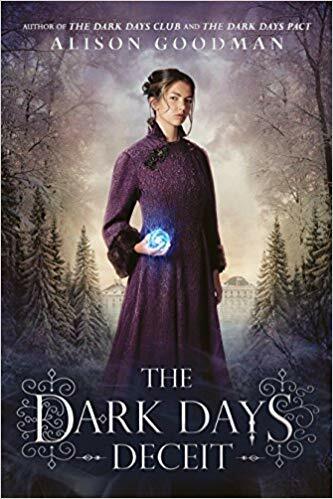 As the final installment in the Lady Helen trilogy, The Dark Days Deceit has a lot of storytelling loose ends to tie up. Now more than ever, Goodman's heroine is struggling to balance her two worlds: her family and friends are enthusiastically planning her upcoming society wedding to the Duke of Selburn, but her work as a member of the the Dark Days Club is taking up all of her time and energy. Helen and her Dark Days partner Lord Carlston (who I think is meant to seem darkly charismatic, but still just comes across as super grumpy) have thus far failed to even identify their supernatural enemy, much less come up with a brilliant plan to defeat it. The Dark Days Deceit gets a lot right, but it has one critical flaw: Helen has zero romantic chemistry with her betrothed. She is clearly meant to end up with Lord Carlston (despite his grouchiness), which makes her scenes with Selburn feel like a total waste of time. Goodman's gift for writing enthralling action sequences and fondness for historical research are as impressive as ever, but the lack of a compelling love triangle is a problem that her other strengths can't overcome. [VAGUE SPOILER AHEAD] The duke plays too large of a role in the story to be so relentlessly unappealing, which means that his mere presence telegraphs more than I think the author intended.